Xinxin Yang is currently a PhD student at the Terahertz and Millimeter Wave Laboratory (TML). She was born in China in 1988. She obtained B.S. degree in Materials Physics from Hebei University of Technology in 2011 and the M.S. degree in Electronics and Communication Engineering from Suzhou Institute of Nano-Tech and Nano-Bionics, Chinese Academy of Sciences in 2014. Since April 2015 she joined TML in Chalmers University of Technology. 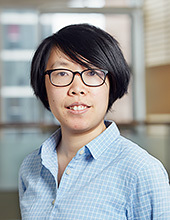 Her research involves graphene electronics for microwave and terahertz applications. There might be more projects where Xinxin Yang participates, but you have to be logged in as a Chalmers employee to see them.